We are excited to lead the way in the 2017 Scottish Food & Drink Fortnight by highlighting our focus on flying the flag for homegrown producers across Scotland. During these two weeks only, Sept 2-17, we are offering our customers a 10% discount on their purchases when they mention ‘Scottish Food & Drink Fortnight’. 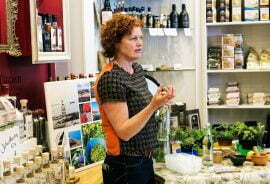 Photo: Lussa Gin is an adventure in gin with Claire Fletcher describing local botanicals. So how better to celebrate the Fortnight than with a spot of gin, vodka or whisky?! Join us on the dates below to meet and chat with producers, taste their tipples and purchase a bottle or two with our Fortnight 10% discount. Each producer is also donating a bottle for us to raffle off to customers who share their email.